A smallpiece of space junk will fly uncomfortably close to the International SpaceStation late Friday and may force astronauts aboard the outpost to take shelterin their Russian lifeboats. NASA?sMission Control radioed the six astronauts on the station earlier today toalert them of the approachingspace junk, which will fly within 1,640 feet (500 meters) of the orbitinglaboratory Friday night at 10:48 EST (0348 Saturday GMT). Sending theastronauts into their Soyuz lifeboats would be a precaution only, NASAofficials said. Currently, the space junk poses no threat to the station or itscrew, they added. ?It?s pretty unusual,? said Kirk Shireman, NASA?s deputystation program manager, said of the shelter plan in an interview. ?I wouldn?tbe surprised if the need to do it for this [debris event] goes away.? The objectis likely very small because it is difficult totrack, NASA spokesperson Rob Navias told SPACE.com. News of its closeapproach to the station came too late to steer the massive orbiting laboratoryclear using its Russian thrusters. ?We don?tknow what it is or the size,? Navias said. Stationastronauts will find out before the end of the day today whether they?ll haveto sleep inside the two Soyuz spacecraft that serve as ferries to and from thestation, as well as lifeboats in an emergency escape. Another option is to wakeup before the space junk zooms by and then take shelter for a short while untilthe threat has passed, Navias said. 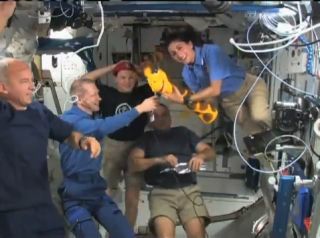 The stationcrew is due to go to sleep at about 4:30 p.m. EST (2130 GMT). This is notthe first time a piece of wayward space junk has come close enough to sendastronauts into their Russian lifeboats. A closepass by an old rocket engine remnant sent three station astronauts intotheir Soyuz spacecraft earlier this year in March. Since then, however, thespace station?s crew size has doubled to six astronauts, so two Soyuz vehiclesare currently docked to the station. The spacestation is currently home to two Americans, two Russians, a Canadian andBelgian astronaut Frank De Winne of the European Space Agency, who commands theteam?s Expedition 21 mission.